I love gazpacho this time of year – tomatoes and strawberries are at their sweetest, the temperatures haven’t dropped yet; you can eat this soup and pretend it’s still July. This version calls for only one tomato (or you can substitute 6 Tbsp of tomato juice) and the rest of the soup is carried by the berries – which add an interesting but not overpowering sweetness to the dish. 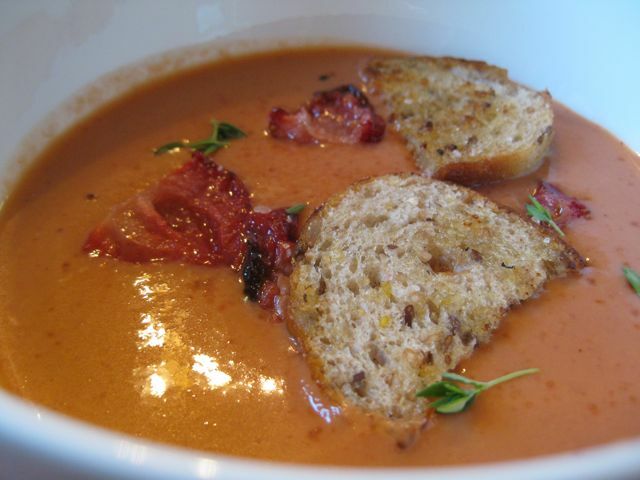 This is Strawberry Gazpacho but definitely NOT dessert soup; it’s a rather refined version of the traditional gazpacho. Make it one quiet night at home and keep it in the fridge overnight to serve at the next evening’s dinner – it looks and tastes like you were slaving away all day. 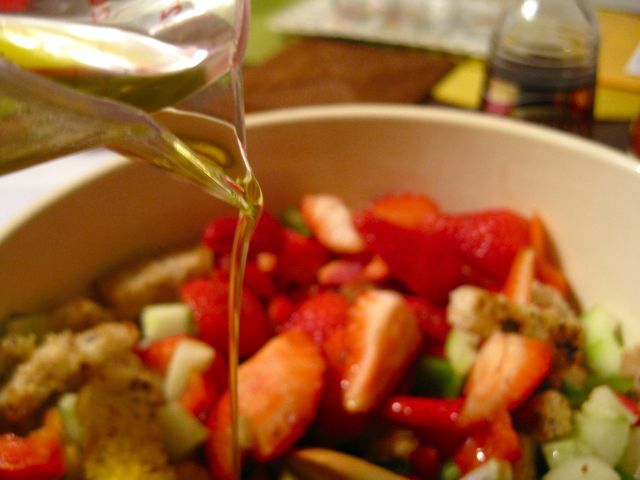 In a large mixing bowl, stir together the cut strawberries, cucumber, peppers, tomato, 1 tbsp garlic, ½ c olive oil and red wine vinegar. Mix well and set aside. In a small sauté pan over medium-high heat, heat a bit of olive oil with the remaining garlic and thyme until the garlic begins to brown. Add cubes of whole grain bread, and toss to coat, turning periodically until the bread is a golden brown. 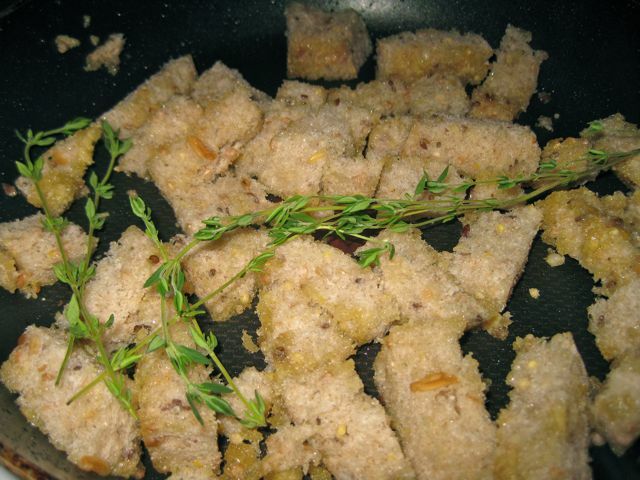 Discard the thyme, and add the bread cubes to the vegetable/fruit mixture. Salt and pepper judiciously, toss well, and cover it with saran wrap for 3 hours at room temperature until the flavors have a chance to mingle. 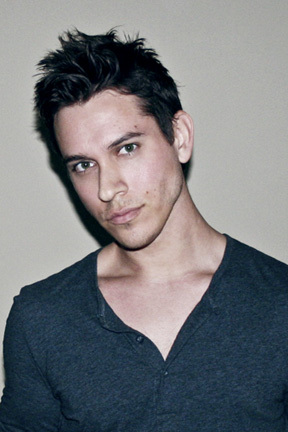 (If you leave it out longer, say, to grab a drink at a bar, there’s no harm in that). Once marinated, puree the mixture in batches in a blender or food processor on the highest speed until it’s as smooth as you can get it. 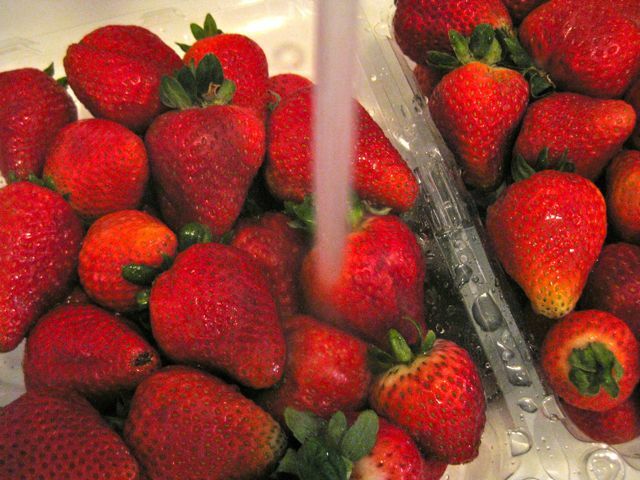 Then pour the puree into a sieve over a mixing bowl, stirring to allow the liquid to drip into the bowl (while leaving those pesky strawberry seeds and other detritus in the sieve). 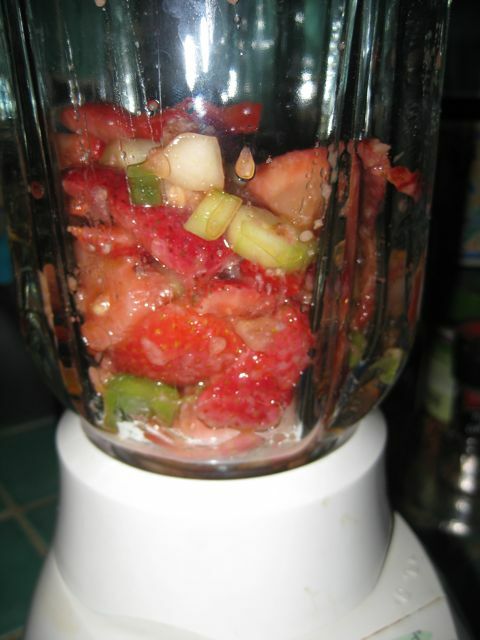 Repeat until the entire mix has been pureed and strained. Cover and place the bowl of soup in the refrigerator until well chilled; several hours or overnight. An hour before serving, gather your garnishes. 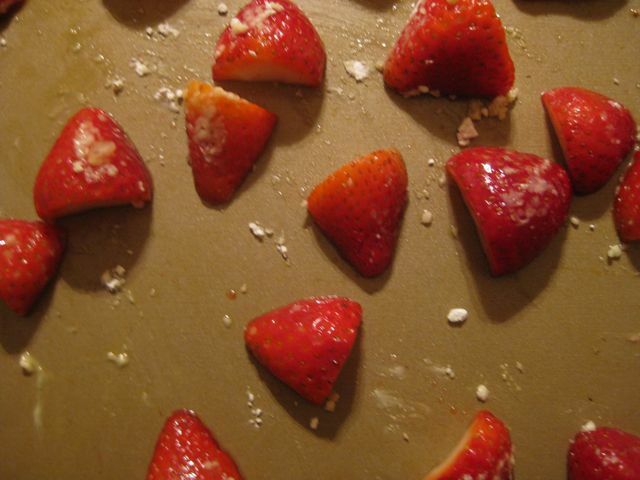 Preheat the oven to 250 degrees F. Toss the halved strawberries with olive oil to coat, and place them cut side down on the baking sheet. Sprinkle the berries with powdered sugar and bake for 30 minutes, flip them over with tongs, and bake for another 30 minutes until the strawberries shrink a bit and become maroon in color and slightly caramelized. Remove from oven and allow to cool. To serve, ladle strawberry gazpacho into 6 bowls. 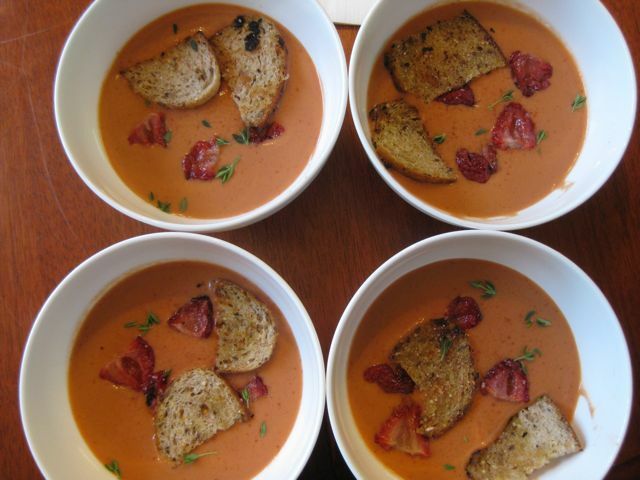 Top each bowl with 2 crostini, several leaves of thyme, and 3 roasted strawberries. Indian Summer in a bowl. 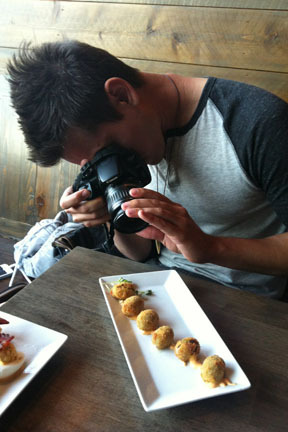 Nutritional Info (1 Serving): coming soon!